One of the often-quoted sayings of Joseph Pilates is that “in 10 sessions you will feel the difference, in 20 you will see the difference, and in 30 you’ll have a whole new body”. Through teaching pilates, I meet lots of people who would indeed like to “get a whole new body”. For some, the impetus for doing pilates is to relieve backache, sciatica or some other niggling pain; for others, it’s to lose some body fat and shape up. Often, it’s a bit of both. But I have always been uncomfortable with the idea that pilates will give you a “whole new body,” because your body’s shape and weight is the result of the calories you consume (food and drink) less what your burn off (through everyday and other physical activities). Into this equation comes the tricky issue of metabolism. While some people appear to have a slower metabolism than others, for what it’s worth, I think people who have a “fast metabolism” are probably more just active – more fidgety maybe – than others? Clearly, the more active you are, the more calories you burn. You can control how active you are – decide to be more active! and you can control what you put into your body – decide to put good things in your body. Back to the idea of putting good things in your body: my suggestion is to cut back on bread and to choose to eat only really good bread. Commercially produced white sliced pan may taste good in the mouth for a few minutes (especially toasted! ), but makes me feel bloated before long. In my house, white bread is a rarity – often bought by my other half if we are on holidays! I tend to seek out a good, wholemeal brown or rye bread. But lately, I’ve been baking this bread – it’s got no flour at all in it and it’s full of really good things like nuts and seeds. Very nutritious and does not cause bloat. It is heavy, but it is very filling and you don’t need much. And you can toast it and put delicious things on it! My two daughters are starting to like it; my other half, now he’s another day’s work! Add oil and water (maple syrup/honey); mix well. Allow to stand for 1 hour, at least. Put into greased and lined standard loaf tin; press down so it’s about an inch thick. Bake in 180 degree oven for 40 minutes, then turn over and bake again for 20 minutes. Cuts really well when cool. Keeps for a good few days in the fridge. (If you feel like a biscuit, cut off a little bit instead and put some honey or jam on it!). Put good things in your body! Doing pilates regularly can certainly help with toning muscle and improving posture (so you feel and look better), but it is only part of the picture. Try including this life-changing bread as well! Through teaching pilates, I meet lots of people who would indeed like to “get a whole new body”. For some, the impetus for doing pilates is to relieve backache, sciatica or ease tension in neck and shoulders; for others, it’s to lose “shape up”. Often, it’s a bit of both. 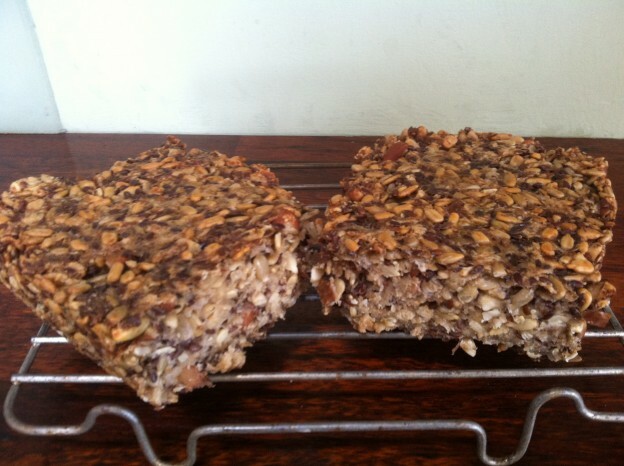 This entry was posted in Blog and tagged bread, diet, food, health, natural on 2 September, 2014 by Eimear.